The Wall Street Journal did an interesting feature Sunday on South Carolina's loss to Florida. 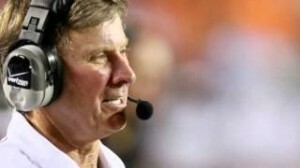 The WSJ wondered if Steve Spurrier trying to convert his style of play to more like Nick Saban is hurting him. Spurrier revolutionized the SEC back in the 1990's with his run and gun style, but since his return from the NFL, Nick Saban's style of a strong running game and a strong defense, has dominated the SEC. Despite having a strong defense and a strong running game, Spurrier's Gamecocks are missing one thing that Saban's teams always had;good quarterback play. Spurrier's teams haven't had consistent quarterback play since he has been at South Carolina which has held them back from winning a championship. To read more of the Wall Street Journal's Saban and Spurrier comparison, check out this link.